One of the longest running conflicts in the West has been the issue of Northern Ireland and like my post from last week about the gradual radicalization of India’s independence movement, an understanding of how the conflict in the North ended up descending into the worst sort of communal violence is critical in these times of political tension around the world. 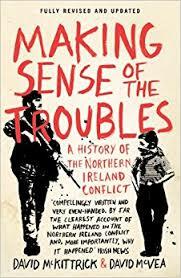 The origins of the conflict are complex and go back to Irish independence which was granted to the 26 southern Counties in agreement with England in 1921 while the 6 northern Counties, were retained as part of the U.K.
For a detailed account about how Northern Ireland descended into violence, I recommend Making Sense of the Troubles by David McKittrick, a journalist, and David McVea, a former teacher. According to McKittrick and McVea the turning point came in Londonderry in August, 1969 when a march by a Protestant marching order, The Apprentice Boys of Derry, ended in violence between Catholics and Protestants in what came to be known as the Battle of the Bogside. 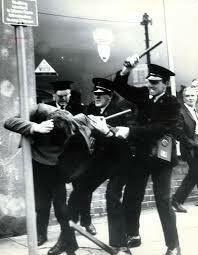 The provincial police tried to impost order on both sides but were perceived as helping the Protestants. Londonderry has already scene a violent outcome to another March in October, 1968. That March was called by left wing groups and had been violently suppressed by the province’s police, the RUC, as the marchers had been denied a permit for their demonstration. 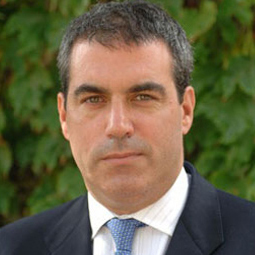 The image of Gerry Fitt, a member of the British parliament being struck in the head at that March had attracted headlines around the world. In 1969, The violence in Londonderry spread quickly to other parts of the six counties and particularly to Beflast and left eight people dead and 750 injured as well as damage to hundreds of homes and buildings. The English army was eventually called in to restore order. Thus began what the Irish call “The Troubles” and while the shootings and bombings were nominally about communal rights and a political conflict between communities, it was also a way for vicious and murderous people to live outside the law. In the end, The Troubles would cost 3,600 lives and it took the people of the North almost 30 years before putting into effect the Good Friday Agreement which finally ended the conflict in 1998. As I wrote in another post after visiting Belfast for the first time in April, the so called Peace Lines separating Catholic and protestant neighborhoods are still visible in the City today. To diffuse tensions in such a situation it is critical that all parts of civil society take a collective deep breadth and give themselves and each other time to think through what is really most important. In Northern Ireland the Protestant Marchers insisted on the rights to march while the catholics felt the marchers hurt their dignity. Such claims and counterclaims do not help to solve problems. Protests and police actions, if needed, need to be done in a tremendously careful way in order to avoid misunderstandings and violence. Throughout history there are many examples of grievances being worked out and accommodation and compromise winning the day. Such efforts require leadership and a bit of patience. Such is the essence of politics. In this, Northern Ireland again provides an illustrative example. The province has actually been operating without a government since a crisis in January caused it to collapse. The parties, however, are still talking to each other and according to Reuters, Sinn Fein expects that a new agreement will be in place by the end of the month.